A solid 1821 pattern light cavalry sabre, presumed to be a Prussian made British officer's campaign sabre. It looks like an 1821 pattern British light cavalry trooper's sabre, but it isn't. First there are no ears to the grip. Also, there are no markings whatsoever. So this has to be an officer's campaign sabre, the sabre he actually used in the field of battle. It is an extremely well built and solid piece, that is for sure. The twisted grip wire bindings tell me it is almost certainly Prussian made, as was fairly common of the time. The 35 1/2 inch blade is in very good order, some old rust patches but not too much, and is firm in the hilt. The hilt is aged but in good order. The leather grip is original and worn in places. The twisted grip wire bindings are in good order. 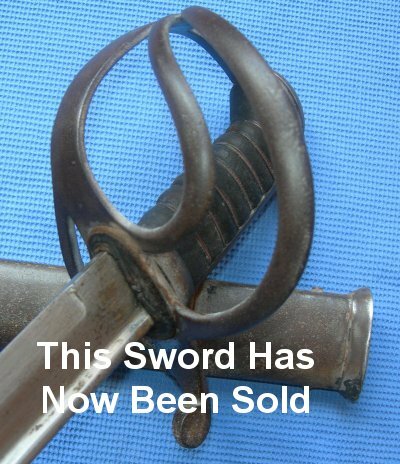 The steel scabbard is in good condition and the sword sheathes well. This is a killing piece, not a dress sword.